Fort Wayne City Utilities is committed to protecting the quality of our rivers and to keeping the community informed about events that may affect them. Click here to subscribe to receive notice of combined sewer overflow events. 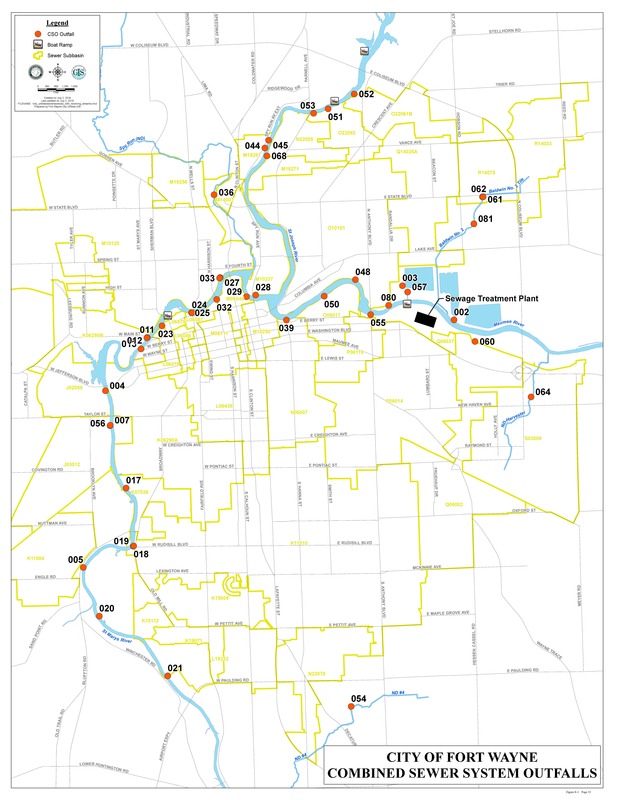 About a third of the city of Fort Wayne is served by combined sewers. Combined sewers collect sewage from homes, businesses and industries and carry it to the Water Pollution Control (sewage treatment) Plant for treatment. When it is not raining, all the sewage goes to to the plant and is treated. When it rains or when snow is melting, these combined sewers also collect and carry rain water runoff or melting snow. Sometimes the sewers cannot carry all of the combined wastewater flow so the sewer system allows some combined sewage to be discharged to the rivers. When sewers were being designed and built in the late 1800s and the first half of the 1900s these combined sewer overflows were an acceptable way to design sewer system. Following the implementation of the Clean Water Act in the 1970s, combined sewers could no longer be built and communities with combined sewers are now required to make significant investments to reduce these combined sewer overflow events. Fort Wayne's combined sewer overflow outfall locations are shown on the map below: Click for larger map. The spreadsheet below contains information about combined sewer overflow events that may have occurred within the past 7-days including locations where overflows have occurred, times when the overflows began and ended and an estimate of the amount of sewage released. This information is updated each week on Wednesday. The information published on this web page is for general information purposes only and is not to be considered a final report for purposes of satisfying any applicable legal requirements. While Fort Wayne City Utilities endeavors to provide accurate and up to date information, it makes no representations or warranties of any kind, whether express or implied, with respect to the completeness, accuracy, or reliability of the information presented. Formal monthly reports of operations (MROs) are provided to the Indiana Department of Environmental Management and may be accessed through its website.